Employers, human resource professionals, academics and other experts are gathering at a conference tomorrow to discuss how to promote fair employment practices in Singapore. Organised by the Tripartite Alliance for Fair Employment Practices (Tafep), among others, it hopes to spread the word on best practices and will be opened by Acting Manpower Minister Tan Chuan-Jin. Many developed economies - including Japan, South Korea, Taiwan and Hong Kong - have laws to promote fair employment and protect workers who feel they have been discriminated against. Barring some limited provisions - such as those protecting women and older workers from being fired because of their pregnancy or age - Singapore has no laws on workplace discrimination. Instead, it believes in what Tafep refers to as a "promotional and educational approach" - getting companies to understand what is fair and stick to it. Indeed, conferences, training, advocacy and sharing of best practices are the Republic's preferred way of promoting fairness in the workplace. This approach is undoubtedly beneficial for companies. But it is not clear if it has helped workers receive the protection they deserve if they find it difficult to get jobs, are unable to get promoted or are fired because of prejudice, rather than performance. Complaints to Tafep, the go-to body for employment discrimination cases, are on the rise. Despite not having legal powers to investigate cases or take errant employers to task, Tafep received 303 complaints last year, up from 115 two years earlier. In 2007, a year after it was set up, it received only nine complaints. Half of the complaints last year concerned nationality, followed by age, race and language. The numbers may well be the tip of the iceberg, as some workers say that with no specific anti-discrimination laws, complaining is a waste of time. The Government has long maintained that having such laws could make the labour market more rigid, increase business costs and erode Singapore's economic competitiveness. But aside from Singapore, all the top 10 economies on the latest Global Competitiveness Report have anti-discriminatory laws in place, although Switzerland, which tops the list, just ahead of Singapore at No. 2, has fewer such provisions than some other European countries. But such laws have not hurt the global competitiveness of the others on the list - Finland, Sweden, the Netherlands, Germany, the United States, Britain, Hong Kong and Japan. The US is on the list despite discrimination being deemed unlawful in as many as 11 categories. While too much protection may not be good, Singapore, it may be argued, has too little. Meanwhile, the jury is out on whether existing awareness-raising efforts by Tafep are having the desired effects. In a bid to build a fair work environment through engagement and understanding rather than punitive laws and litigation, for example, Tafep encourages companies to sign a pledge committing to fair employment practices. The number of signatories tripled from 602 in 2007 to more than 2,000 last year. But that remains a drop in the ocean, given that around 400,000 businesses are registered here. Besides, signing on does not necessarily make an employer a fair employer. In 2011, two government agencies were found to have set age limits in tenders for security guards, though both had signed the pledge to select and recruit employees on merit, "regardless of age, race, gender, religion or family status". One had even renewed the pledge. Last month, news broke that three other government agencies had done the same thing. All three had signed the Tafep pledge. 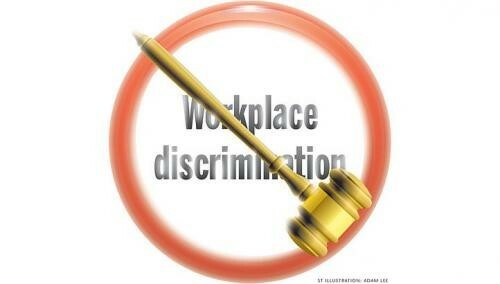 The Government has stressed in recent months that workplace discrimination will be dealt with firmly. The Acting Manpower Minister told Parliament in March that workers must enjoy equal opportunities, whether in hiring or career advancement and that Tafep would investigate complaints more thoroughly. His ministry is also getting tough with employers with hiring practices that favour foreign executives who do not have national service commitments and are often available at lower salaries. Foreign bosses accused of preferring to "hire their own kind" are also under scrutiny. But more is needed to protect workers who feel discriminated against on the job. For one, Tafep could be more transparent. It says most errant companies it counsels heed its advice. Some aggrieved workers disagree. Given the heavy cloak of confidentiality over Tafep proceedings, it is impossible to gauge the truth. Tafep also needs to investigate discrimination claims and possibly even name and shame errant employers. An alternative would be to set up an independent workers' body to investigate grievances, suggest redress and promote worker welfare. Tafep, which represents employers, the Government and unions, is seen by some to have too many bosses. Unions traditionally represent worker interests, but fewer than a fifth of companies here are unionised. Complaint-handling is therefore left largely to human resource departments of companies which, employees say, tend to side with management. There are employees who say they have been discriminated against because of nationality, age, disability or race, but given the lack of laws, some say they suffer in silence. Others claim they turned to the authorities but were dissatisfied with the outcomes. The Sunday Times has previously reported about employees who complained that they faced sexual harassment at work but that complaining got them nowhere. Ms Carol Tan (name changed), 33, told The Sunday Times she was a new employee in a foreign oil and gas company and faced frequent lewd comments from her boss. When he proceeded to give her a neck rub, she lodged a workplace sexual harassment complaint with her human resource department. She said she had witnesses to back up her story, but she was told there was not much the company could do, as her alleged harasser was the "top guy in Singapore". She complained to both the police and Tafep, hoping that her company would put in place proper grievance handling procedures and discipline the man. All she got, she said, was an SMS apology. She eventually resigned and now lives abroad. Fair employment guidelines and pledges that don't have the force of law behind them may well be ineffective. As Singapore ages, remains open to foreign workers and more people with disabilities enter the job market, incidents of age, nationality or disability-based discrimination can only rise. Last Wednesday, The Straits Times reported that the Government was studying civil mediation procedures in Hong Kong and Britain on how to prevent squabbles between neighbours, among other disputes. Similar studies need to be done to see how to better handle employer-employee disputes too. Above all, it is time to relook whether employees here need greater legal protection against workplace discrimination. Proponents in other countries say legislation, while expensive, paves the way for a more equal, just and inclusive society and is an effective deterrent to companies that ride roughshod over workers' rights. Singaporean John Lim (name changed) is a passionate advocate for such laws, no surprise given his allegations of unfair treatment at work. He told The Sunday Times that he was working in a top position at an international development agency in Washington, DC when he was headhunted for a senior job with a foreign bank in Singapore. But after less than two years, the master's degree holder in his early 50s was retrenched. He claims he was replaced by a less qualified British expatriate. Around the same time, the bank replaced a few other Asian employees with Caucasians. He said he approached lawyers, unions, Tafep and Government representatives here, but his efforts came to nought as the company, which gave him a severance payout, had not broken any law here. The finance professional, who has spent nearly a decade working in the US and Australia, could have launched civil proceedings against his former employer, but it would have been expensive. Convinced that he was wronged, he said: "It's sad that in our own country, professionals don't get the basic protection they deserve."